Nearly 15 million blood transfusions are performed each year in the U.S., and pediatric patients alone receive roughly 425,000 transfused units. 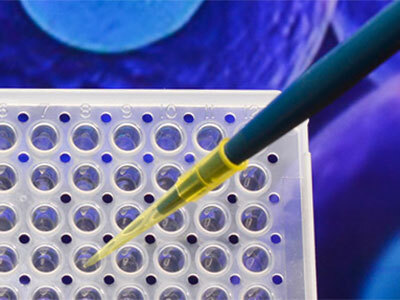 Endocrine-disrupting chemicals, such as bisphenol A and di-2-ethylhexyl-phthalate (DEHP), can leach from some plastic devices used in such transfusions. However, it remains unclear how many complications following a transfusion can be attributed to the interplay between local and systemic reactions to these chemical contaminants. Top: Live, excised heart that is being perfused with a crystalloid buffer via the aorta. The heart is stained with a voltage-sensitive fluorescent dye, which is excited by an LED light source. 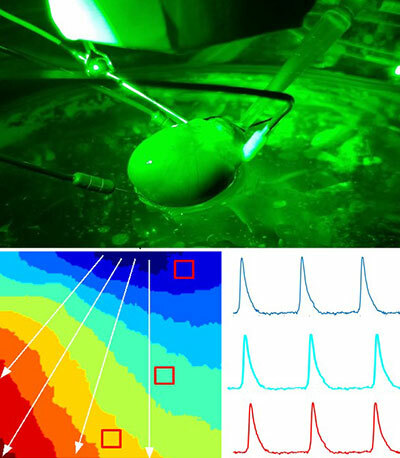 Bottom, right: Cardiac action potentials are optically mapped across the epicardial surface in real-time by monitoring changes in the fluorescence signal that are proportional to changes in transmembrane voltage. Bottom, left: An activation map (middle) depicts the speed of electrical conduction across the heart surface. Credit: Rafael Jaimes, Ph.D.; Luther Swift, Ph.D.; Manelle Ramadan, B.S. ; Bryan Siegel, M.D. ; James Hiebert, B.S., all of Children’s National Health System; and Daniel McInerney, student at The George Washington University. 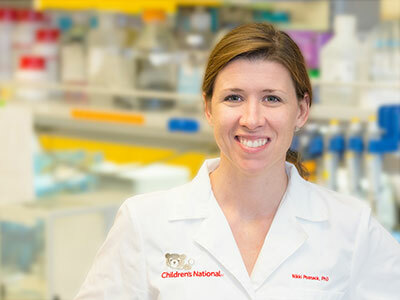 The National Heart, Lung and Blood Institute within the National Institutes of Health has awarded a $3.4 million, five-year grant to Nikki Gillum Posnack, Ph.D., assistant professor at the Children’s National Heart Institute within the Sheikh Zayed Institute for Pediatric Surgical Innovation (SZI) at Children’s National Health System, to answer that question and to provide insights that could accelerate development of safer biomaterials. According to the Food and Drug Administration, patients who are undergoing IV therapy, blood transfusion, cardiopulmonary bypass or extracorporeal membrane oxygenation or who receive nutrition through feeding support tubes have the potential to be exposed to DEHP. Posnack led a recent study that found that an experimental model exposed to DEHP experienced altered autonomic regulation, heart rate variability and cardiovascular reactivity and reported the findings Nov. 6, 2017, in the American Journal of Physiology. The pre-clinical model study is the first to show such an association between phthalate chemicals used in everyday medical devices like IV tubing and cardiovascular health. 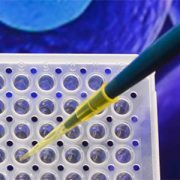 Compare and contrast alternative biomaterials, chemicals and manufacturing techniques to identify safer transfusion device options. 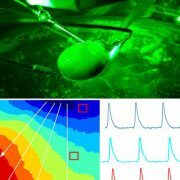 “Because phthalate chemicals are known to migrate out of plastic products, our study highlights the importance of adopting safer materials, chemical additives and/or surface coatings for use in medical devices to reduce the risk of inadvertent exposure,” explains study senior author Nikki Gillum Posnack, Ph.D.
An experimental model exposed to di-2-ethylhexyl-phthalate (DEHP), a chemical that can leach from plastic-based medical devices, experienced altered autonomic regulation, heart rate variability and cardiovascular reactivity, according to a study published online Nov. 6, 2017 by the American Journal of Physiology. The pre-clinical model study is the first to show such an association between phthalate chemicals used in everyday medical devices like IV tubing and cardiovascular health. Patients undergoing extensive interventions to save their lives may be exposed to multiple plastic-based devices that supply oxygen and nutrition or that pump newly oxygenated blood to oxygen-starved organs. In order to assess the safety of phthalate chemicals used in such medical devices, the Children’s-led research team implanted adult experimental models with radiofrequency transmitters that monitored their heart rate variability, blood pressure and autonomic regulation. Then, they exposed the experimental models to DEHP, a softener used in making the plastic polymer, polyvinyl chloride, flexible. DEHP-treated pre-clinical models had decreased heart rate variability with lower-than-normal variation in the intervals between heart beats. The experimental models also showed an exaggerated mean arterial pressure response to ganglionic blockade. And in response to a stressor, the experimental models in the treatment group displayed enhanced cardiovascular reactivity as well as prolonged blood pressure recovery, according to the study team. 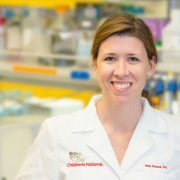 Billie Lou Short, M.D., chief of Children’s Division of Neonatology, called the paper an “important study” that builds on a foundation laid in the late 199os by Children’s researchers who were the first to show that plasticizers migrated from tubing in the extracorporeal membrane oxygenation (ECMO) circuit. Children’s researchers also led a study published in 2004 that evaluated the effect of plasticizers on the human reproductive system. A small number of adolescents who had undergone ECMO as newborns did not experience the complications that had been seen in in experimental models, Dr. Short says. Posnack’s study co-authors include Rafael Jaimes III, Ph.D., SZI staff scientist; Meredith Sherman, SZI research technician; and Adam Swiercz, Narine Muselimyan and Paul J. Marvar, all of The George Washington University.